If you're preparing for law school, your single biggest hurdle is the Law School Admission Test or LSAT. This three and a half hour exam consisting of five multiple choice sections and one timed writing sample can make or break your legal aspirations. Fortunately, LSAT For Dummies, Premier PLUS 2nd Edition—now with access to practice tests online prepares you for the LSAT by giving you proven test-taking strategies and ample practice opportunities. From the book you'll gain the vital tools you need to understand the reasoning behind analytical reasoning, get a handle on logical reasoning, flaunt your talent in the writing section, master reading comprehension, and much more. Plus, go online and study wherever and whenever with free access to additional LSAT practice opportunities; and the ability to create customized practice in the subjects you need to study the most. 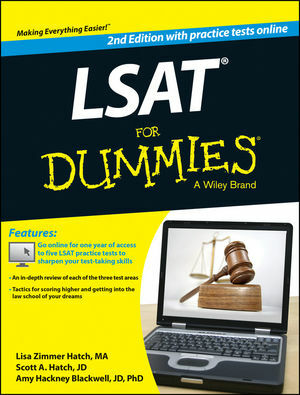 If you're an aspiring lawyer and want to put your best foot forward, LSAT For Dummies, Premier 2nd Edition has you covered. Lisa Zimmer Hatch and Scott A. Hatch have prepared students for standardized testing from more than 300 universities. Amy Hackney Blackwell is a former attorney who received her JD from the University of Virginia School of Law.